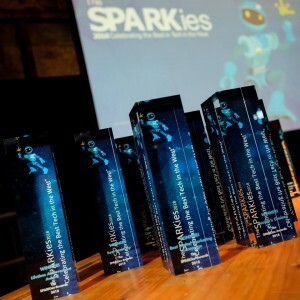 Nominations have opened for The SPARKies, the coveted awards showcasing the best of the West of England’s tech sector. The awards, now in their seventh year, recognise the businesses and individuals who make Bristol, Bath and surroundings a tech powerhouse and shine a light on their amazing wealth of tech and creative talent. Nominations for the 16 categories have increased steadily over recent years and organisers are hoping for another record year. Attendances at the awards ceremony have also risen – last year’s event at Bristol’s Motion nightclub brought together more than 300 of the region’s tech and digital community. As the ceremonies alternate on an annual basis between the two cities, this year’s will be in Bath on June 27. Established Bristol tech businesses, start-ups, scale-ups and individuals have fared well over recent years at the SPARKies. The 16 categories are Best Digital Design, Founder/Entrepreneur of the Year, Best Cyber Company, Best Mentor or Advisor, Data Data Data, Most Exemplary use of Virtual or Mixed Reality, The Hardware Award, The ‘Good’ Award – which covers green tech, sustainable tech and hardware for assisted living – Most Innovative Use of Tech, Lifetime Achievement, The ‘Totally Killing It’ Award, Best Start-up, Best Scale-up, Best Place to Work in Tech, and The People’s Choice – the winner of which will be chosen by the SPARKies audience on the night. The FutureSPARK award goes to the person aged under 25 who has already demonstrated true commitment and initiative within the tech and digital community and who the judges believe will go far in the tech industry. The SPARKies are staged by TechSPARK, the information hub for all things tech in Bristol, Bath and the West of England.